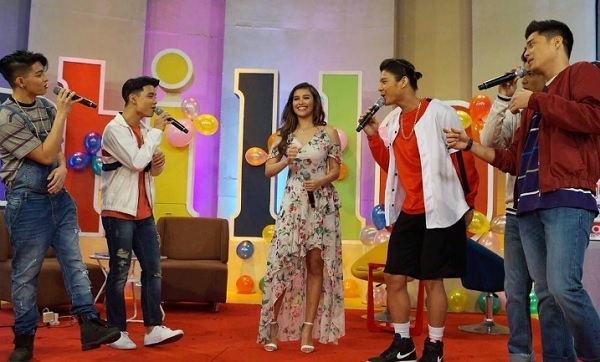 The newest boy group in Philippine entertainment, BoybandPH, had a chance to serenade one of today's hottest female celebrities, Liza Soberano. On ASAP Chillout, the Sunday variety show's live online portal, the boys -- Russel Reyes, Ford Valencia, Tristan Ramirez, Joao Constancia, and Niel Murillo -- sang a few lines of their newest single "Unli" for the lead actress of Star Cinema's upcoming movie this Valentine's season, My Ex And Whys. Last week, BoybandPH launched the official music video of "Unli," which features Liza's co-ASAP IT Girl member, Janella Salvador, who's our first artist to hold a digital concert this year. READ: After So Many Requests, Your SUPER Wishes Have Finally Been Granted! Written by Gabriel Tagadtad and produced by Kiko Salazar and Kidwolf, "Unli" is included in the boyband's upcoming debut album under Star Music. Do you look forward to another IT Girl to be serenaded by Russel, Ford, Tristan , Joao, and Niel? Comment below!